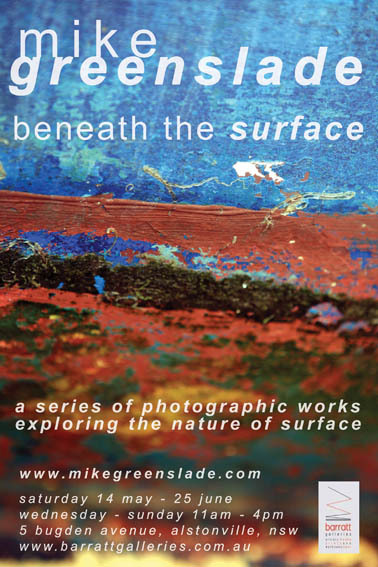 Below is the press release and poster of my forthcoming exhibition, “Beneath The Surface” due to open at Barratt Galleries, 5 Budgen Ave, Alstonville, NSW, 2477 on 13th May. The show will run until 25th June, when it will become available on the web. There is sneak preview on my website in the personal work section. Everyone who subscribes to the blog up until 25th June will go in the draw to win a singed fine art print of their choice. Alstonville photographer, Mike Greenslade presents a series of photographic works exploring the nature of surface and the action of the elements and light-play on the hulls of boats. The result is a collection of colourful and intriguing “found paintings”, pre-existing abstract landscapes captured in camera. The project began in Mike’s native Cornwall, where Mike’s hobby of pilot gig rowing took him to many of the area’s working harbours. The brightly painted fishing boats moored in places like Newquay, Penzance and Mousehole and the sailing craft stored on Loe Beach provided a rich source of inspiration. “I’ve always been interested in making close-up, abstract images and as with any photography project the more you look, the more you see. I am drawn to harbours, beaches or seafronts wherever I am and I have captured images from places as diverse as Morocco, Indonesia, Turkey and Papua New Guinea as well as Australia.